When Kaevara arrived at the hospital, the doctor allegedly refused to tell him his wife’s condition. “We were given a prescription to buy tablets to abort the pregnancy as the doctor had said there was no hope that the baby would be born alive,” Kaevara told The Namibian yesterday. He said they bought the tablets from a Katutura pharmacy since the hospital pharmacy had run out of stock. But to their surprise, the baby was born alive after the woman had taken the prescribed tablets to induce the abortion. 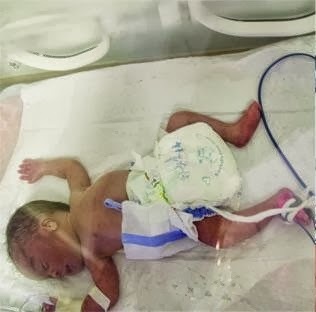 The father left the hospital ward while his wife was giving birth but to his shock the baby which had been given no chance of life was born alive weighing 1,5 kilogrammes. “Why did the doctor tell me that there was no possibility of the baby surviving? Why did he make my wife try to abort the pregnancy?” said Kaevara. He said that they are devastated after the birth of their child since they feel betrayed. “We trusted these people but look at what they have done. They made a wrong diagnosis. I did not receive any counseling from nurses or an apology from the doctor after what happened. I am suffering,” Tjombe said. Take a look at that baby. Babies like that are aborted every day in the world. But we're not supposed to feel sorry for them. And nothing is more important than the right to kill little babies like that. Now, you might argue that this woman was effectively coerced into an abortion. But what difference does it make to the baby whether the abortion is consensual or coerced? Both lead to an equally dead baby. But we only feel pity for this one, because he survived. He got his umbilical cord cut, and he took his first breath. For the rest of the babies who don't make it through the birth canal alive, well tough luck for them! But don't forget we're the haters for opposing killing babies like this. We're the manipulative misogynists. Facts are emotionally manipulative things, you know.